Lazydays is one of the nicest and most reasonably priced campgrounds we have stayed at in a long time. Campsites are easy to get into, level and each has a picnic table and chairs. What’s really neat is that there are orange, grapefruit and lemon trees on many of the sites. The facilities are clean and well maintained. Security is great too! They have a gate guard and you are escorted right to your site. The campground is very quiet at night. 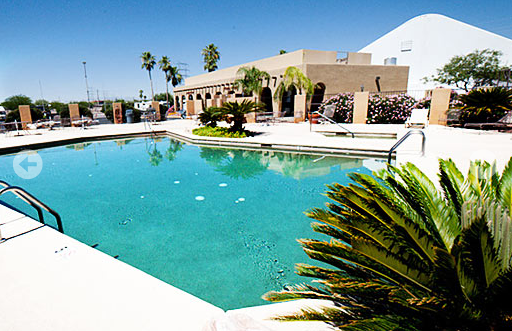 Amenities include two swimming pools, two spas, exercise room, laundry, and a huge air-conditioned convention center. Also bocce ball, a putting green, horseshoes and other games. It’s pet friendly here too! They have a large dog park. They also have a nice, well stocked campstore and an on-site restaurant with reasonably priced meals. They have free wi-fi too! The staff was helpful, courteous and friendly. We would definitely recommend Lazydays RV Campground to our friends.